This is Part II of a three-part analytical series written by Dr. Alexandre Y. Mansourov assessing the leadership changes during Kim Jong Un’s initial year in office. This article will analyze key dynamics within the Kim family, including the rising influence of Kim Jong Un’s uncle Jang Song Thaek and the emergence of Kim’s wife, Ri Sol Ju as a factor in family politics, as well as the regime’s efforts to preserve and modernize the Kim monarchy. It will also discuss how the regime seeks to strengthen the socialist party-state, reinvigorate the party’s central leadership institutions, tighten the party’s control over mass public organizations, and watchfully manage the party’s center-periphery relations. Dr. Mansourov’s research and analysis is based solely on publicly available materials. The views presented here are his own and do not reflect the official position of any government, departments, or agencies. A year after Kim Jong Il’s death, the Kim family continues to rule North Korea for the seventh decade in a row. The system executed Kim Jong Il’s October 8 will with little resistance from vested interests by promptly reaffirming Kim Jong Un as “the only successor to Kim Jong Il standing at the helm of the Korean revolution and the cause of Juch’e ideas” and as “the only center of unity, cohesion and leadership of the WPK and KPA,” thereby delegitimizing all other possible successors and contenders to the throne. On December 30, 2011, the Workers’ Party Korea’s (WPK) Central Committee (CC) Politburo appointed Kim Jong Un as the Korean People’s Army (KPA) Supreme Commander; the Fourth WPK representatives conference elected him as the First Secretary of WPK CC and Chairman of the WPK Central Military Commission (CMC) on April 11; the Fifth Session of the 12th Supreme People’s Assembly (SPA) elected him as First Chairman of DPRK National Defense Commission (NDC) two days later; and, finally, the WPK CC, CMC, NDC, and SPA Presidium awarded him the land’s highest military title of Marshal in a rare joint decision on July 18, thus completing the ceremonious process of placing Kim Jong Un at the top of the North’s party, state, and military hierarchies. Defying pundits’ expectations, Kim Jong Un secured the formal trappings of power in just four months in contrast to Kim Jong Il, who had mourned his father’s death for three years before officially assuming the top leadership posts. On the one hand, such a rush to transfer power ensured there would be no power vacuum at the top of the governing pyramid that could potentially upset the system’s equilibrium, invite opportunists, and cause political instability. On the other hand, it prompted questions about the successor’s filial piety and personal insecurities. At the time of Kim Jong Il’s death, many North Korea watchers believed that Kim Jong Un’s uncle Jang Song Thaek, 66, could emerge as a regent figure, exercising significant power at least during the new leader’s early period in office. These expectations proved to be correct: in less than a year, Jang emerged as the most dynamic and dominant power broker behind the throne, after systematically dismantling the successor support group put in place by Kim Jong Il before his death in 2011 and elevating a cohort of the party officials personally loyal to him to key power-wielding and policy-making positions. Jang catapulted from the 19th place in the North’s power hierarchy, as exemplified by his place in Kim Jong Il’s state funeral committee membership list, to the number five position right behind four remaining WPK CC Politburo Standing Committee members (Kim Jong Un, Kim Yong Nam, Choe Yong Rim, and Choe Ryong Hae) even ahead of his wife Kim Kyong Hui. This was evidenced by his place in the official listing of the senior party, state, and military leaders who attended the inaugural ceremony at the renovated Kumsusan Palace of Sun on December 17, 2012. Acting head of the KPA General Political Department (GPD) and later minister of defense Kim Jong Gak, in November. At the same time, Jang ensured the rapid promotion of the senior party officials with whom he has worked together since his days at the Korean Socialist Youth League, including the new General Political Department Director Choe Ryong Hae, Pyongyang party boss Mun Kyong Dok, the party secretary responsible for South Korea Kim Yang Gon, his right-hand man at the WPK CC Administrative Department Ri Ryong Ha, director of WPK CC Mass Public Organizations Department Ri Yong Su, North Korea’s Ambassador to China Ji Jae Ryong, and others. It remains to be seen whether these officials will stay loyal to Jang in the long run. But, if they do not, the latest surprise demotion of Jang’s protégé Choe Ryong Hae from vice-marshal to four-star general may offer a glimpse of what punishment may await those who become too arrogant and whom Jang might suspect of switching sides: the angered regent will not hesitate to strike even against one of his own people to protect his power base and teach a lesson to all others. Despite Jang’s steady rise in power and status, some skeptics still believe his ability to control the elites and the prospects for his grab for absolute power are limited by the fact that he belongs to a different clan, albeit married into the Kim family. They assert that Jang derives his power from his marriage to Kim Jong Il’s younger sister Kim Kyong Hui, who is the reported official executor of his estate and last will. As a result, Jang’s overwhelming influence as a power-brokering regent will last only as long as she is alive and well. But because her health is rumored to be deteriorating, these skeptics predict a rather short regency for Jang, too. However, in my opinion, we should not underestimate Jang’s ability to survive, given the fact that he outwitted and outlived those people who had purged him in the late 1970s, mid-1990s, and mid-2000s. I believe Jang is now busy removing his potential rivals and installing his loyalists to cement a power base of his own and make sure he will survive as one of the North’s rulers even after his wife’s departure from the political scene. It is clear Jang has recently outgrown the narrow confines of his formal position as director of WPK CC Administrative Department and NDC vice-chairman, even though it gives him enormous policy-making and supervisory powers over a very important segment of the country’s power bloc. The WPK CC Politburo’s decision on November 4 to form the State Physical Culture and Sports Commission headed by Jang to spearhead Kim Jong Un’s new drive to build up the North as a sports power endowed him with an institutional platform to encompass and guide all party, government, and military organizations at the central and local levels beyond the power bloc institutions. While his nephew remains at the helm of the National Defense Commission, Jang set up his own all-nation supra-Cabinet Commission subordinating many key Politburo, CMC, NDC, and Cabinet members and leaders of mass public organizations to his control, who previously had not been under his supervision. In doing so, he covered all important political and socio-economic constituencies, significantly extending his power base. Jang may be scheming to create an autonomous center of power on the basis of the Sports Commission as an alternative to the NDC in the long run. Kim Jong Un’s marriage last June, less than six months after his father’s death, introduced a new wild card into the North’s ruling clan politics. The emergence of the non-traditional Ri Sol Ju factor modernizes and complicates the political landscape. The first lady could be both an asset and a liability. On the positive side, she can boost the regime’s continuity and vitality by delivering the long-expected fourth generation successor. She can also act as a strong advocate of high-level attention to important social issues, especially women’s concerns, and can offer a public relations bonanza to a regime seeking to present a softer, gentler, more human face for the Kim monarchy. On the negative side, her alternative opinions may foment cracks in the inner circle, undermining political stability, especially if the new leader really listens to her. In any case, the unfortunate fates of Kim Il Sung’s and Kim Jong Il’s former wives are worth keeping in mind. Key unknowns are Ri’s relationship with Kim Jong Un’s other relatives and his close advisors, particularly with his powerful aunt Kim Kyong Hui and sisters Kim Yo Jung and Kim Sol Song. Also unknown is Ri’s parents bearing on her position and influence. I have no information on these relationships but recognize that they may have significant impacts on the first lady’s position in the leadership hierarchy and her status and influence within the Kim clan as well as in Kim Jong Un’s household. In bringing Ri forward, the regime may have been motivated by Kim Jong Un’s desire to distinguish himself from his father and grandfather, to demonstrate that he is a more modern ruler, to ease the legitimization process for his future successor, and, possibly, to show a different normative construct for husband-wife relations in North Korea. But, after her brief initial introduction, the regime may have reverted back to the traditional way its propaganda machine has treated first ladies, engulfing them in a veil of secrecy. Alternatively, the regime may have decided to scale back Ri’s public profile either to accommodate her growing pregnancy, or in an effort to adapt to the reported international and possibly internal criticisms of her appearance and activities while still grappling with the challenge of defining her public image and acceptable roles. third party representatives’ conference in September 2010, and strengthened at the fourth party representatives conference held in April 2012. To reinforce political control over the party establishment, Kim Jong Un used its machinery to pack the WPK supreme leadership bodies—the Politburo, Secretariat, Central Military Commission, and Central Committee departments—with his loyalists. In the past year, Kim revived the old forgotten practice of using the party Politburo platform to legitimize changes in the supreme leadership. He did it only three times, which underlined the paramount importance of these decisions concerning the fate of number one and number two persons in the country: the December 30 Politburo’s extraordinary meeting appointed Kim as the KPA Supreme Commander; the July 15 extraordinary meeting removed number two strongman Ri Yong Ho from power; and the November 4 enlarged meeting appointed regent Jang Song Thaek as Chairman of Physical Culture and Sports Commission. The party’s control over mass public organizations and their membership, which serve as “transmission belts” designed to spread the party ideology and influence across the North Korean society and to mobilize various social groups to implement party policy and appeals, remains unchallenged, despite some predictions about possible social unrest and breakdown of social controls in the wake of Kim Jong Il’s death last December. Only one of the four leaders of mass public organizations—First Secretary of the Central Committee of Korean Socialist Youth League (KSYL) Ri Yong Chol—was replaced with Chon Yong Nam this past March. That move probably reflected the party’s growing concern over the so-called youth problem, the threat of the Western-led “ideological and cultural poisoning” of the young generation, its declining fervor in defense of the Juche ideas, and subsequent loosening of the party’s grip over the hearts and minds of the young successors to the Korean revolution. The leadership of the other three organizations—General Federation of Trade Unions of Korea (GFTUK), Korean Democratic Women’s Union (KDWU), and Union of Agricultural Workers of Korea (UAWK)—was left unchanged for the time being. After arranging for a successful nationwide celebration of the maiden Mother’s Day in November, the first new national holiday established by Kim Jong Un, the KWDU leadership appears to have been able to overcome the bad memories held by the Kim family about its past disloyalty when the KDWU provided a platform for anti-Kim Jong Il’s activities conducted by his stepmother while Kim Il Sung was still alive. With the exception of Pyongyang city politics, the new regime managed party center-periphery relations without any major innovation over the past year. Noteworthy is the replacement of two out of three Pyongyang city leaders, which probably reflects the efforts of Pyongyang city party boss Mun Kyong Dok, one of Jang Song Thaek’s long-time loyalists, to help Jang consolidate his power base in the nation’s capital. The new regime did replace three out of ten provincial party chief secretaries and three out of ten provincial people’s committee chairmen in the past twelve months (see Table 1). But that fits the past pattern of provincial party and government personnel management practiced by the WPK CC Organization and Guidance Department (OGD). What is striking, though, is that five out of six of their predecessors were appointed by Kim Jong Il in 2010, which probably reflects Kim Jong Un’s dissatisfaction with his father’s choices. Report on Meeting of Political Bureau of WPK Central Committee, KCNA, December 31, 2011. “조선로동당 제４차 대표자회 진행,” Rodong Sinmun, April 12, 2012, http://www.rodong.rep.kp/InterKo/index.php?strPageID=SF01_02_01&newsID=2012-04-12-0004&chAction=S&strSearch=%EA%B9%80%EB%9D%BD%EA%B2%B8. “Fifth Session of 12th SPA Held,” KCNA, April 13, 2012. “Kim Jong Un Awarded Title of Marshal of DPRK,” KCNA, July 18, 2012. Cho Jong Ik, “Kim Jong Un to Split Up Party-military to Secure Cadres,” Daily NK, December 21, 2011. “Power Struggle Begins in N.Korea,” Chosun Ilbo, December 22, 2011, http://english.chosun.com/site/data/html_dir/2011/12/22/2011122200865.html. “Jang Song Thaek and Choi Ryong Hae solidify their positions of power,” The Hankyorye Sinmun, July 19, 2012, http://www.hani.co.kr/arti/english_edition/e_northkorea/543297.html. “Kim Jong Un’s Uncle Gains Control of N. Korea,” Chosun Ilbo, July 30, 2012, http://english.chosun.com/site/data/html_dir/2012/07/30/2012073001542.html. “National Funeral Committee Formed,” KCNA, December 19, 2011. “주체 금수산태양궁전 개관식 엄숙히 거행,” Rodong Sinmun, December 18, 2012, http://www.rodong.rep.kp/InterKo/index.php?strPageID=SF01_02_01&newsID=2012-12-18-0004. 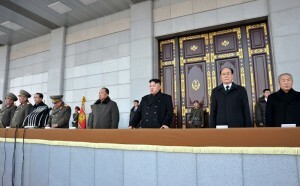 “The ‘Gang of 7’ Behind Kim Jong Un,” Chosun Ilbo, December 29, 2011, http://english.chosun.com/site/data/html_dir/2011/12/29/2011122901522.html. “N. Korea purged senior intelligence official: source,” Korea Times, April 17, 2012, http://www.koreatimes.co.kr/www/news/nation/2012/06/120_109120.html. Choe Sang Hun, “Top North Korean Defense Official Replaced, South Korea Says, “ New York Times, November 29, 2012, http://www.nytimes.com/2012/11/30/world/asia/top-north-korean-defense-official-replaced-seoul-says.html?_r=0. “Ousted N.Korean Army Chief ‘Defied Orders,’” Chosun Ilbo, July 27, 2012, http://english.chosun.com/site/data/html_dir/2012/07/27/2012072700918.html. Choe Sang Hun, “Top North Korean Defense Official Replaced, South Korea Says,” New York Times, November 29, 2012, http://www.nytimes.com/2012/11/30/world/asia/top-north-korean-defense-official-replaced-seoul-says.html?_r=0. Nick Miller, “Kim Kyong Hui’s Health and the Fate of Jang Song Thaek,” Korea Economic Institute, October 1, 2012, http://blog.keia.org/2012/10/kim-kyong-huis-health-and-the-fate-of-jang-song-taek/. Kim Yong-jin, “N. Korean leader’s aunt in ill health,” Korea Times, September 7, 2012, http://www.koreatimes.co.kr/www/news/nation/2012/09/116_119396.html. “Who Runs North Korea?” Chosun Ilbo, December 18, 2012, http://english.chosun.com/site/data/html_dir/2012/12/18/2012121800673.html. Kim Il Sung, at Kim Jong Il’s urging, moved his second wife Kim Song Ae off the political stage because of her efforts to diminish the role and image of Kim Jong Il’s biological mother Kim Jong Suk, and thereby presumably undermine Kim Jong Il’s succession and elevate her own children’s prospects. Kim Jong Il reportedly separated from his first wife Kim Yong Suk and exiled his second unofficial wife Song Hye Rim to Moscow where she died from health problems in 2002. “검은 상복 입은 北 리설주, 초췌한 얼굴로…,” JoongAng Ilbo, December 17, 2012, http://joongang.joinsmsn.com/article/225/10191225.html?ctg=1000%20%20&cloc=joongang|home|newslist1. 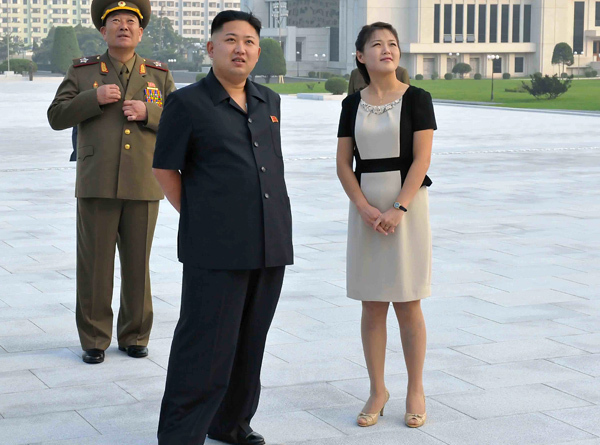 “Images suggest North Korea leader’s wife pregnant,” Agence France-Presse, December 17, 2012, http://www.scmp.com/news/asia/article/1107108/images-suggest-north-korea-leaders-wife-pregnant. On January 1, 2012, the WPK CC Politburo had 27 members (3 standing committee members, 10 full members, and 14 alternate members). On April 11, 2012, the fourth party representatives’ conference expanded the Politburo ranks to 34 (5, 15, 14, respectively). As of December 19, 2012, its membership apparently dropped back to 30 (4, 11, 15, respectively), losing those holdovers who failed to secure Kim’s trust or demonstrate their value like Ri Yong Ho, Kim Rak Hui, Ri Thae Nam, and Pyon Yong Rip. The WPK Secretariat stayed stable at ten members: last April, Kim Jong Il’s sister Kim Kyong Hui replaced Choe Ryong Hae as the party secretary probably responsible for organizational affairs, and Kwak Pom Gi replaced Hong Sok Hyong as the party secretary in charge of economic policy, i.e. North Korea’s equivalent of the economic policy czar. The WPK Central Military Commission shrank from 19 last December to 16 a year later, which is expected given the high turnover of senior military officials. The WPK CC department directors and their first deputies almost all remained in office and some even gained in political influence, especially department director Ri Yong Su and first vice-directors Han Kwang Sang and Ri Ryong Ha. “Communique on the Meeting of the Workers Party of Korea Central Committee Political Bureau,” December 31, 2012, Pyongyang Korean Central Broadcasting Station via Satellite in Korean 2100 GMT 30 Dec 11. “Ri Yong Ho Relieved of All His Posts in DPRK,” KCNA, July 16, 2012. Report on Enlarged Meeting of Political Bureau of WPK Central Committee, KCNA, November 4, 2012. “Kim Jong Il’s Death Kept Secret for 2 Days Over Fears of Civil Unrest,” Yomiuri Simbun, December 26, 2012. Kang Mi Jin, “KIS Youth League Gets New Head,” DailyNK, March 23, 2012, http://www.dailynk.com/english/read.php?cataId=nk01700&num=9018. “자본주의사상문화와 청년문제” (“Capitalist Ideology and Culture and Youth Problem”), Rodong Sinmun, October 18, 2012. “DPRK Marks First Mother Day,” KCNA, November 11, 2012. Chairman of Pyongyang City Rural Economic Management Committee Ri Man Song replaced Chang Kwang Hyok in April and Chairman of Pyongyang City People’s Committee Cha Hui Rim replaced Ryang Man Gil in September.